Whenever Mac OS X gets a major update, there's a whiff of panic in the air, due to favourite add-ons suddenly being rendered incompatible. This happened with iStat Menus and Snow Leopard, and our Macs felt naked. Luckily, iSlayer came to the rescue with a major update of its own. iStat Menus 2.0 builds on the solid foundations of its predecessor. 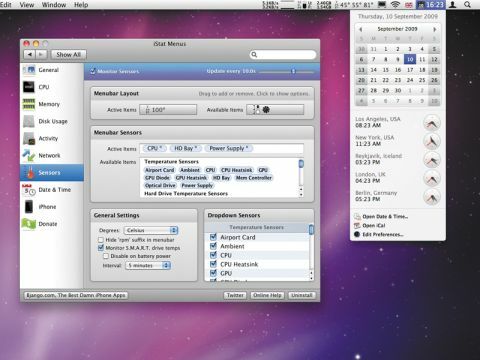 Via its System Preferences pane you add monitoring tools to your menu bar: CPU, Memory, Disk Usage, Activity (for disks), Network, Sensors (for temperatures and fans), and Date & Time. For components with multiple items, drag-and-drop actions enable you to choose which to show; for anything that has more advanced configuration, you just check relevant boxes or drag the odd slider. Changes over version 1.x appear to be 'more of everything' – more options, more widgets, more skins. For tinkerers, there's loads of fun to be had exploring. Once your monitors are running, you can reorder them via Command-dragging, and 'advanced' information (component temperatures and fan speeds within Sensors, a fantastic calendar and world clock within Date & Time, and so on) is accessible via item menus. These also provide access to the relevant configuration pane within iStat Menus and related apps (such as Activity Monitor and Console from the Memory item). iStat Menus 2.0 is robust, stable, well-behaved – and it's still free, so we strongly recommend donating if you like it as much as we do.